Here at Midland Handling Equipment, we offer a broad range of belt conveyor systems. Our belt conveyors are built to specific client’s requirements and are most commonly used in the Food Industry, Pharmaceutical Industry and other Hygiene Industries. They are ideally used where aluminium is not approved and where rigorous hygiene regulations are in place. We pride ourselves on providing the highest quality, long-life machines. Our Flat Belt Conveyors are simply a strap mechanism working to keep things flowing, getting items from A to B without the need for manual labour. The belt conveyors job is to ensure items are smoothly passed along a line which is ideal for more fragile goods. With all conveyors, the belt runs over the folded edge of the frame reducing the risk of material falling onto the returning belt. We supply a broad range of conveyors in different sizes to suit your business, warehouse and stock load size and weight. Our range of different conveyors start from belts to slat conveyors which are suited to various business types. Whether they are packed or unpacked products in irregular shapes, different conveyors suit different products. We stock horizontal belts, elevating belts, belt bends (corners) and swan neck belts so whatever you need we stock it here at Midland Handling. 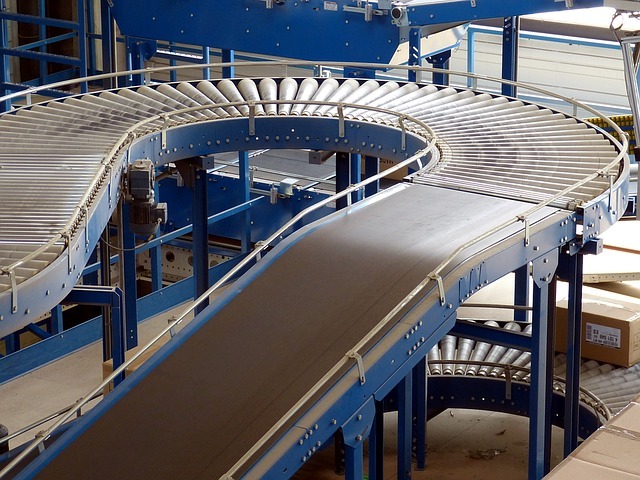 Conveyors are reliable components used for automated distribution, often in Warehouses. These labour saving systems have grown in popularity over the past decade allowing companies to receive higher volumes with little effort. Belt conveyor systems are a great way to maximise your production line with the helpful and handy motorised element. Midland Handling Equipment is a well established UK manufacturer of belt conveyors, which is just one reason to choose us to manufacture your system. Comprehensive Service – Our teams are in-house which means everything is under one roof, from the Design Teams to Production, Testing and Installation Teams. This cuts the production time with everyone being a stone’s throw away if issues do arise they can be fixed immediately. Trained & Certified – All staff members are Trained & Certified in their respective fields, so you can be confident your project is in safe hands. Over the years our teams have had experience manufacturing and installing a variety of complex belt conveyor systems. In-House Testing – We test every single conveyor system that we manufacture. Giving all of our products a thorough test is standard here at Midland Handling Equipment, and extremely important. If any errors do occur during the testing process, our Mechanical and Electrical Engineers will find the most effective solution. Documentation – Once the testing is done, our Administration Team will provide you with all of the Legal and Health & Safety documentation that’s required for your belt conveyors. For more information on our conveyors, Inverted Monorails or Plate link Conveyors get in touch with our friendly team today on 0116 259 3175.